Built in 2003 at the foot of the Golden Rock,hotel in the heart of Mon State, 168km from Yangon. 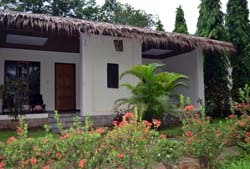 Our Bungalows are built in a splendid tropical garden with stunning views of the mountain range surrounding our spacious elegantly furnished rooms with private veranda to relax, enjoy the Golden Sunrise! Together with our customers , we support the youth development center Seik Phu Taung in Khyaiktho where over 700 poor and orphaned children get school education . The small maternity in Kinmon village gets the necessary supplies and support. Indulge in the exciting Asian flavors , great Western dishes or enjoy delicious Snacks and Drinks . Near Kyaiktiyo Pagoda, Adjacent to Foreigner’s Registration Office Kyaikto Township, Mon State, MYANMAR. The hotel is situated at a vantage point – literally on top of the mountain, commanding a panoramic view of the lush mountain ranges below where one can experience spectacular view of sunrise and sunset – sights that will leave a lasting impression. A full serviced restaurant and bar in the main building, serving a wide range of menu including Myanmar cuisine, Chinese and vegetarian dishes as well. A variety of red and white wine along with beer, soft drinks and tea / coffee are available at both dinning room and lobby bar. A 24-hour laundry service is available.